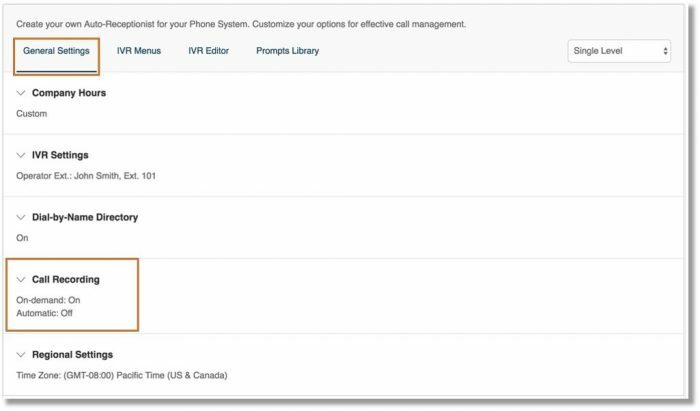 This article provides information on how to access and enable Call Recording on your AT&T Office@Hand account. Call Recording is a feature on your AT&T Office@Hand account which enables you to record incoming and outgoing calls automatically. You can also playback the recordings, download the recorded call logs for sales and support training, compliance and etc. Go to Phone System > Auto Receptionist > General Settings, click Call Recording. Click on the link to enable or disable On-demand Call Recording or Automatic Call Recording.